In 1965, the Sarasota District of the United Methodist church purchased 5.2 acres of property on the NE corner of Cypress Lake Drive and Winkler Road. Nine years later, in 1974, the Conference constructed the first building on the property, which is now our Youth Center. The Reverend James R. Maxfield was appointed Pastor and served from 1974-1980. The first worship service was held on October 6, 1974, and the attendance far exceeded the capacity of the building. On March 23, 1975, the church was officially organized with a charter membership of 156 members. Immediate plans were made for the construction of a larger building. Our second building, now the Fellowship Hall, was constructed to be used as an interim sanctuary. The first worship service was held Christmas Eve, 1976. By this time, the membership increased to 246. The present sanctuary was constructed and the first worship service was held on Christmas Eve, 1983. In June 1988, the 5-acres of church property located immediately north of the sanctuary became available and was purchased. This property included a house, which now serves as a multipurpose building for groups and classes. In 1985, the church sponsored a preschool program – Bright Beginnings Early School. Soon after, we needed to expand our facilities again. So in 1990, a 10-room Education Building was constructed and was occupied in June 1991. In the 1990s, the congregation continued to grow; the church staff also expanded to meet the church’s needs. In 1998, the chapel complex was constructed, adding an additional worship space, more classroom space, a bride’s room, an additional kitchen, and multipurpose space. In 2010 the church embarked on a capital campaign to renovate the sanctuary. Construction began in 2012, adding a covered drive-up entry, an expanded lobby with coffee area, a Welcome Center, a new nursery, stadium seating and additional office space. 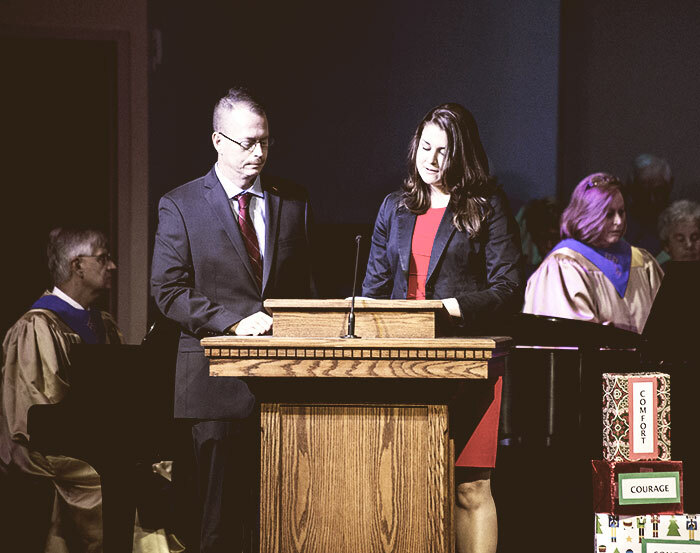 Our first service in the renovated Sanctuary was November 24, 2013. In 2015, the Fellowship Hall was repurposed to better serve the needs of our Children’s Ministry. It is now the dedicated home to our J.A.M. (Jesus & Me) program on Sunday mornings and Wednesday evenings, as well as to our Mommy and Me groups during the week. All classrooms in the Fellowship Hall are now outfitted with furniture and supplies for children, and the check-in kiosk for children’s programs is now located in the lobby.